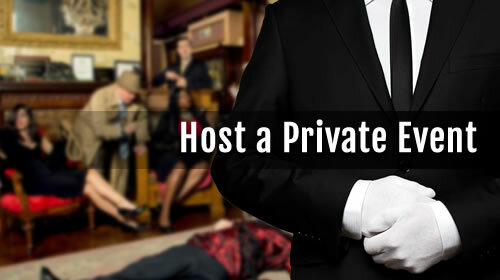 Murder Mystery Dinner Theater Parties in Denver, CO | Denver Murder Mystery Co. Here in Denver, there is no shortage of things to do, but The Murder Mystery Company wants to invite you to try the best new thing in town: a murder mystery dinner! Join us for two and a half hours of killer entertainment paired with a murderously delicious three course dinner to spice things up on your next night out. You will be immersed in the action of a whodunnit much like a live-action game of Clue, wherein you are working to solve the case, but may also find yourself a suspect! If a public murder mystery dinner in Denver isn’t quite your scene, we can come to you, whether you’re at home or at any of the fabulous venues the area has to offer. 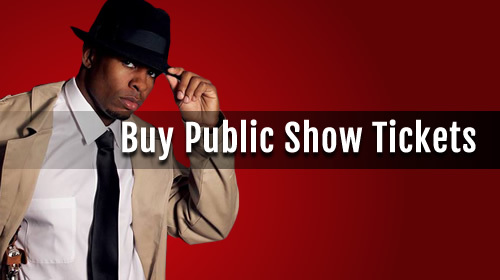 We’ll perform a customized show for your event that will fit right in with any occasion or schedule. We love birthdays, holiday gatherings, and family get-togethers, and we’d be honored to attend your next party to give your guests the thrilling entertainment they crave. They'll love our themed whodunnits, and you’ll love how easy it is to craft a perfect party. Your show or event will be performed by the best of the best in Denver. Our actors are top-notch performers who have taken part in hundreds of shows. They want your experience with The Murder Mystery Company to be absolutely killer, so rest assured that you’ll be witnessing some of the most talented performers around as they guide you through an immersive and comedic investigation. No matter how you choose to partake in our thrilling cases, you’re guaranteed a night of sleuthing and solving with Colorado's experts in mystery entertainment. Our comedic crimes offer you the chance to think like a detective while you and your friends examine evidence, interrogate suspects, and catch the culprit before the evening ends. Attending a Denver murder mystery dinner or party is the most excellent way to spend your free time. Once you solve a mystery with us, you’ll be screaming for more!